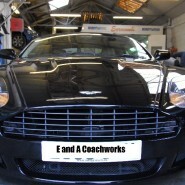 Here at E and A Coachworks you can rest assured that we are doing a professional job to the utmost. Having had a presence on Porsche forums for a number of years, we have become very familiar with all the Porsche models down the years, and have carved out somewhat of a reputation with Porsche owners both inside and outside of London. In the last few years we have seen many other marques coming through our facilities, including Ferrari, Lamborghini and Aston Martin. Whether it is to touch up your stone chips on the front spoiler, or a complete restoration, we have the experience and expertise to make you, the discerning owner, more than happy.